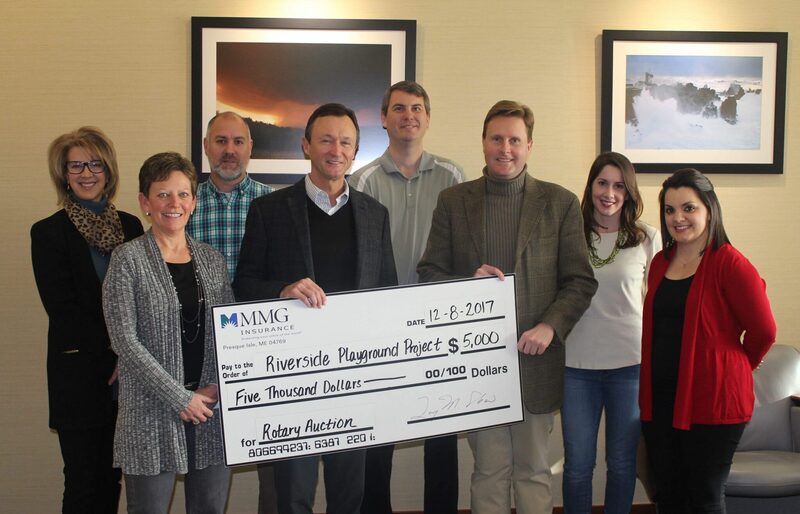 MMG Insurance is pleased to announce its support of the Riverside Park Community Playground Project in Presque Isle. The Company will contribute $5,000 to the effort, which is being led by a collaborative effort between the local Rotary and Kiwanis Clubs as well as the United Way of Aroostook and the City of Presque Isle. The final layout and scope of the playground will be determined based on the level of funds raised. Currently, four site plans have been proposed, each with a wide variety of play structures, interactive settings and adaptive equipment. Organizers say there is no other comparable option in this region and the impact to the community will be far-reaching. “We are so grateful to have MMG Insurance as a partner in our fundraising effort” said Jane Towle, Rotary Playground Project Co-Chair. “MMG has a keen understanding of how important a vital community is, and encouraging a healthy outdoor lifestyle from a young age is increasingly important to families. The new state-of-the-art playground will be equally appealing to current residents as well as potential new residents considering a move to the area, and is considered the final building block of the revitalized Riverside recreation area. Thanks to MMG’s continued dedication to the community, this dream will become a reality next summer”. The Community Playground Project will be the featured initiative during this year’s 70th annual Rotary Auction, to be aired on WAGM-TV on Saturday, December 16th.